Authors aren’t just writers that sells books today but we are also Entrepreneurs who now have lots of opportunities to build an online business around writing and all that goes with it as been an author has gone beyond just writing a book and finding who will buy it.. 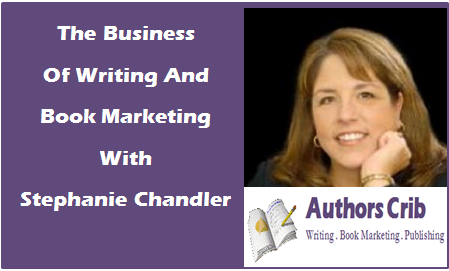 But if you ask how Authors can build their online business around writing, then join me to welcome Stephanie Chandler to do justice to that question. I interviewed Stephanie Chandler to share some useful book marketing and business tips for authors. I’m super excited to welcome her to The Savvy Indie Expert Author Hot Seat today and without wasting time, here is my interview with Stephanie. Stephanie: In 2003 I opened a 2,800 square-foot bookstore in Sacramento, CA. My goal was to sit in the back office and write novels! As it turned out, I lacked the imagination to write fiction. Luckily, I quickly discovered I had a passion for business and marketing. I wrote my first book – The Business Startup Checklist and Planning Guide, but couldn’t get an agent. They all told me I had no platform—nobody knew who I was. Based on that feedback, I decided to launch a website called BusinessInfoGuide.com, with the goal of attracting my target audience of aspiring entrepreneurs. A few months later I self-published the book, listed it for sale on the site, and it began selling immediately. That’s when I really began to understand the power of building an audience online. When I wrote my next book, From Enterpreneur to Infopreneur, I sent the proposal to two publishers and signed a deal with John Wiley and Sons a month later. The difference this time was that I had a high-traffic website, which meant I had an audience. I was suddenly attractive to publishers. After that, I signed with a literary agent and sold two more books. Along the way, I sold my bookstore and decided to consult and speak full-time. But many people were asking me how to get their books published, so in 2008 I launched a company to help with that: Authority Publishing. I eventually got turned off by traditional publishing (the lack of control, the paltry royalties), and returned to self-publishing. I am extremely grateful for that decision. Mayowa: Let’s start from the scratch, I am an author and I’m just starting out, what are your best tips on how to prepare for life as an indie author? Stephanie: Start a blog—stat! A blog is a powerful way for authors to begin to build an audience, which should ideally be done before the book is released. Add new posts at least twice per week, and then share those blog posts across your social media networks. This alone will make a big difference. Mayowa: It’s very easy today to get book self-published – the likes of Amazon, Kobo and Smashwords have make things easy for publishing a book from any corner of the world but is the choice of any of this have an effect on the success or otherwise of a book bearing in mind that Amazon seems to be the most common platform. Can an author do well on other platforms as well? Stephanie: I’m a bit biased here, since I run my own custom publishing company – Authority Publishing. However, I do think that your publishing imprint matters. If you publish with one of the “big box” self-publishing firms, then readers instantly know you’re self-published. And some of those firms are downright awful. I will not call any out here, but will caution authors to ask important questions. Will you be locked in to a contract with the publisher? (You shouldn’t be.) What will be your book cost, retail price, and royalty earned per book? You need to make sure you earn a profit from your book! In my experience, these firms just churn through authors and treat them like commodities. The services are often underwhelming. When you produce a book, you want to make sure that you work with a strong editor, a professional cover designer, and that you have a distinctive interior layout. These are all elements to consider when you work with a company to self-publish your book. Mayowa: Your latest book – The Non-Fiction Book Marketing Plan is all about marketing plan for non-fiction books. What are your best tips on how self publishing authors can plan their way into the top non-fiction bestselling chart. Stephanie: I’m not a big fan of the one-day bestseller campaigns. Instead, focus on how you can be a bestseller for the long-haul. Those one day campaigns can be fun, but they have little long-term results. A better option is to work to build your audience every single day. Content marketing is the way to go: blogging, videos, podcasts, social media—all of these outlets help you to attract readers. Mayowa: Any tips also for Fiction authors as regards a marketing plan for their books? Probably a marketing plan book for fiction writers is on the way? Stephanie: Fiction authors need to get their books into the hands of as many readers as possible. The key is to build buzz. Plan to give away a lot of free copies. Offer your book up to book clubs. Encourage people to write reviews online. It’s a bit different than nonfiction which often solves a problem or fills a specific need. Fiction readers are looking for entertainment and you have to work to convince people that your book is worth reading. Mayowa: As a real life example for authors out there, can you share how you go about marketing your newest book – The Non-Fiction Book Marketing Plan. Stephanie: Well one of the first things I did was put myself on a radio tour. I have an assistant who sends out pitches and helps me get booked. I also set up a sales page with bonus items for buyers, and promoted it to my mailing list and social media networks. And I’m doing lots of guest blog posts and written interviews like this one! Mayowa: There are millions of author out there who only add up to the numbers of authors, how really do you think an author can stand out of the crowd? Stephanie: The best way is to have a niche focus. I could have written a general book marketing guide, but I wanted my book to connect with my audience so I wrote it specifically for nonfiction authors. Identify your ideal audience and how you offer something different from everyone else, and then go out and find them. Mayowa: What mistakes do you really see most authors make the most and your workable advice on how to correct them? Stephanie: The biggest mistake is waiting until after the book is released to begin promoting. Ideally you should start building your audience at least a year in advance. Mayowa: From your experience so far as an author, what do you see as what really sell books? Social Media, traditional media, blogging etc. What are your best tips to sail through the waters of selling books through all these channels? Stephanie: Give your audience great content through your blog, social media, podcasts, videos, etc. It’s all about content marketing online. It takes a lot of work, but it’s a great way to reach readers. Mayowa: Writing as a full business is becoming the norms now with the idea of author entrepreneur, what are your best advices for authors who soon are planning to live off their author career and build a business out of it? Stephanie: Few authors make real money from books, so it’s best to look for income around your book. You can get paid to speak, to place ads in your site, to work with corporate sponsors, with information products, or as a coach or consultant. Use your book as a tool for generating revenue. Mayowa: You just launched Non Fiction Author’s Association. What prompted this idea and in what ways are you planning to help authors through this platform and how authors can be part of it. Stephanie: It has frustrated me for years that nonfiction authors are largely ignored in the publishing world. When you go to a writer’s conference, the focus is often on fiction and children’s books. So I am building a community for authors to connect and learn about marketing. We have a year-round book awards program, monthly teleseminars with publishing industry professionals, and discounts to events like our annual Nonfiction Writers Conference. It is great fun to get to build a community around a topic I am so passionate about. Mayowa: Is self-publishing worth it at all? Stephanie: It is if you have a goal and plan! Mayowa: Where can people find you, your book and Non Fiction Author’s Association if they will like to contact you and connect with you? Stephanie: We offer a free membership level for the association. We also have an annual online conference. And, we offer custom publishing and social media marketing services for authors here at Authority Publishing. You can also connect with me on Twitter. Mayowa: One last word from you – what is your best advice for author out there? Stephanie: Commit to the journey. Few authors find success overnight. You will work hard and you will get frustrated. Don’t give up. Do a few things each and every day to promote your book and build your business (your book is your business!). And remember that it’s a marathon, not a sprint. If you continually put in the effort, the rewards will come. And don’t forget to have fun along the way! And that’s my interview with Stephanie. I hope you find it helpful, if so, help share this interview on Twitter with others you might know that will benefit from this. P.S: If you are wondering how you can sell more books and build your email list as well, feel free to book a Book Marketing Consulting Session with me and let me discuss the best way to sell your books, build you email list, and grow your author platform. Also don’t forget to sign up for my Free 5 Modules Guide – The 80/20 Guide To Book Marketing. This is s 5 part guide that shows you the no wasting or time and energy way to marketing and promoting your books online.